I was taking a major gamble when I packed for a month long trip during a season change and only brought along one facial moisturizer…let alone one I had never tried before! I have heard great things about Kiehl’s as a brand and figured, hey, I’ll pack the Super Multi-Corrective Cream on my trip and see what happens…I’ll either like it or I’ll hate it. The people at Kiehl’s told me that it would significantly improve my skin in two weeks. I think I have pretty nice skin already, so I was skeptical that I would see a significant difference. Wow, was I in for a surprise! I absolutely am in love with this moisturizer. This cream is clinically demonstrated to simultaneously lift, firm, visibly redefine skin contour, and retexturize skin in two weeks and double efficacy within 4 weeks. I’m here to tell you it’s all true. Three ingredients that have never been together in any skin cream came together to create this luxurious cream- jasmonic acid, beech tree extract, and fragmented hyaluronic acid. Tammy Fender Spontaneous Recovery Creme is the closest I’ve ever gotten to a cream that felt this good, and it actually feels pretty similar to this one. At $165 you could go the expensive route, or you could snag this one for $62. Some would argue that both prices are too expensive for skincare. I challenge you to swing by your local Kiehl’s counter and get a sample of this, and you will change your tune. When I apply this cream, it really doesn’t take much. I’ve been using the 1.7 oz jar day and night for 3 weeks and it’s less than halfway gone. I use it on my entire face and neck every time I use it, so I’m not skimping either! It sinks into my skin almost immediately, which is great because I can either go straight to bed, or put a full face of makeup on right after applying it. The entire time I’ve been using this, I haven’t used anything else and my skin hasn’t needed anything else! It’s incredibly moisturizing, but not to the point of being greasy. It has replenished my skin to the point where I’m starting to think the fine lines that were beginning to appear on my forehead were actually just extremely dehydrated skin. I’m shocked by the difference in my skin before and after. The last couple days of product testing, I wore Kiehl’s Midnight Recovery Concentrate underneath it when I applied this before bed. I noticed even deeper hydration and my skin was very glowy the next day. I don’t think I really needed THAT much extra hydration, but I think using these as a duo in the dead of winter will work wonders on my skin. 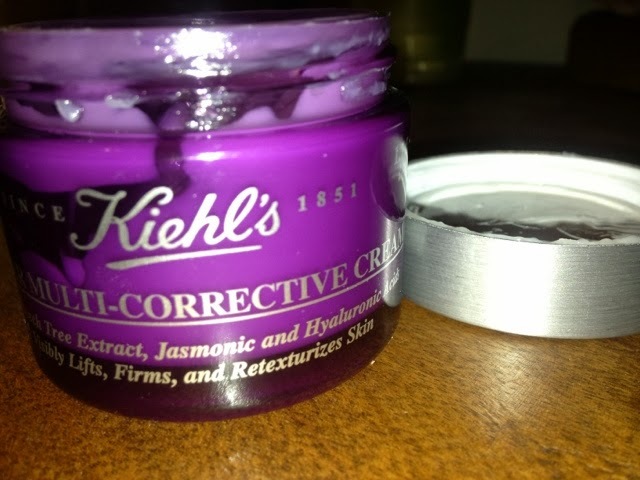 Kiehl’s Super Multi-Corrective Cream is a bit of an investment, but one I recommend with the change in season. Have you ever tried Kiehl’s products? If so, which ones? I would love to hear your experiences in the comments below. Kiehl’s is a relatively new line to me!